What do we do in math? Count. All math is is counting. Every math problem counts something. Believe me I've had this argument in seminars with professors and teachers across the USA. If you aren't counting something you aren't doing math. Period. So one of the most basic concepts I teach ANY student is to ask "what are we counting?" when confronted with a math problem. This page gives specific, time tested techniques on how to start teaching counting to your preschoolers or to your toddler. This is where it all starts: Learning to count. Here is another page that shows you even more on HOW TO TEACH COUNTING. Learning to count is the beginning of a long journey it's the first of the five basic concepts. First hurdle: counting to 5. Use a three period lesson to develop the vocabulary and names of the first five blocks. The names of the blocks are just vocabulary. The same way, for example, this is a "pen", this is a "one"...simple. ...and then add four and five. THEN count to 9 by adding the other four blocks. Start with just three blocks, then five when they know those names add three more and at last all nine. Small steps keep it easy and FUN. This process will take several lessons over several days. Unless the student is older these lessons should be short and will take a couple of weeks depending on many factors but mostly on the age of the child. Younger is better and will take more time. Then count to 20...first you count the nine blocks make a big deal out of it when you get to ten. Then show ten and one is 11, ten and two is 12 and count to 20...the student will see the pattern. The Completely Cool Curious Counters Compendium will help immensely. Get this book and read it as a bedtime story. Go here for more and some fun pre-school math activities. Go here for more on cross teaching multiple concepts, with counting that includes addition, multiplication and fractions. Before we can learn to count, the child must develop a one to one correspondence with numbers. That is, if there are three things on the table...like three pieces of macaroni...they need to see it's three and stop at three. Young students will count after the pattern they have heard. 1, 2, 3, 4, 5, and may keep going even though there are only three things there. This is common and "NORMAL." Here we see a 3 x 12 matrix. The youngest started by counting out three. Then we skip counted as we added macaroni. The oldest did most of the work and the youngest just listened to the patterns without any understanding of the meaning...3 twelves, 12 threes...we counted to 10 several times as we built up...don't have money for expensive manipulatives? Bet you have some macaroni. Eventually they will learn that each number goes with the thing you are counting in a one to one correspondence and in a certain order. It happens one day...and once it happens they don't go backwards. They wake up and suddenly they count 5 fingers and stop at 5. If you have very young children get them to repeat after you and count to 20. Do this often. You don't have to do this during "math time", I mean often as in in the car out of the blue, or during dinner or bath time or bed time: any time is math time. Then count backwards sometimes from 20 to 1. Let them hear the pattern. Just like ABC's except you don't go backwards with ABC's although you should. You count and have them repeat after you one at a time. Then in strings of three, then five then ten. We don't need symbols or deeper understanding we just want to start off with hearing the numbers in order from one to twenty and back again. This will make things easier when they are introduced to blocks and the symbols. Even before we learn to count we can still learn the names of the blocks and symbols and then add more meaning from there. It's basically boils down to learning vocabulary when the child is in the pre-counting stage. This will very quickly go from naming things to naming things in a certain order, which is what we grown-ups like to call counting. Here are some Pre-School Math Activites Once we can count to nine we can start doing "math." There are plenty of activities that can help you start the ball rolling. There are several things you can get [link to Products from Motensen Math] to help start the process. Ebay is a great place to find stuff. Maybe one day I'll have a store there. Meantime, I will show you were to get things either free or on the cheap. If you want brand new, I'll have links to that too. Crewton Ramone's House of math will eventually be your one stop site for math 'resources', to sound all academic-like. A great book is "Ten Apples Up On Top" By Dr. Suess. Eventually I will have a video that shows you how to maximize this simple book for learning to count and add. Just reading it is good but you can use it to greater effect if you count apples, compare apples, add apples and have the child do it with you and for you. Great just before bedtime. Eat. Sleep. Math. Math is everywhere all the time. Make it a fun part of their lives not drudgery. Remember put them in a math rich environment and they will learn math. More fun stuff for counting. 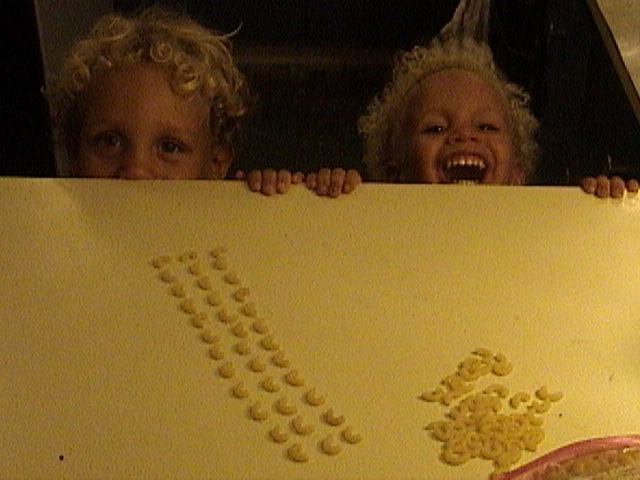 Best stuff for counting is often free or low cost...like raisins, Macaroni or simple playing cards. Counting around the house. Doing dishes. Cooking. Hanging clothes. A little on math terms, place value and more. A place value page cross teach counting too. Go directly to a simple software demo. Here is a simple pres-school math activity that you can do with pre-schoolers without even leaving your keyboard. Maybe you like to play "find it" games. It's a "find the blocks" game. Go from this counting page back home.